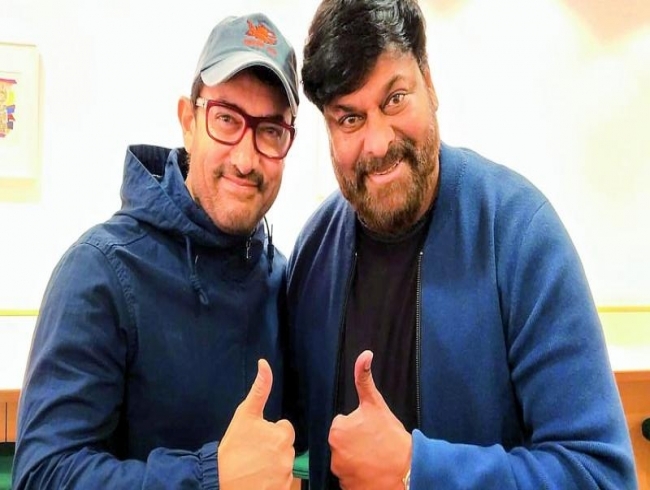 Mumbai: It was a perfect moment for Aamir Khan when he bumped into Telugu superstar Chiranjeevi at the Kyoto airport in Japan last night. Though the actor refrains from Tweeting too much, Aamir took to Twitter to share a picture with the actor. It seems like the two spent their time discussing projects at the airport. “Ran into one of my favourite actors, Superstar Chiranjeevi Garu at Kyoto airport! What a pleasant surprise :-). Discussed his new project about freedom fighter Uyyalawada Narasimha Reddy. You are always such an inspiration sir. Love. a (sic),” Aamir captioned the picture. On the work front, Aamir is preparing for his next film, Lal Singh Chadha that is a Hindi remake of Robert Zemeckis’s 1994 Hollywood film, Forrest Gump. Whereas, Chiranjeevi is spending time in Japan enjoying the Sakura blossoms with his wife Surekha and daughter Sushmita Konidela.